The woman who had to be rescued after she became stuck and was left hanging on a Fort Lauderdale railroad bridge won't face charges because she is legally blind, a spokesman for the railroad said Wednesday. "We've agreed to move on," Florida East Coast Railway Senior VP Bob LeDoux told NBC 6 South Florida. According to LeDoux, railroad police interviewed the woman, 55-year-old Wanda McGowan, on Monday, and were able to determine that she has the disability. "Based on the recommendation of police who interviewed her Monday we won't pursue charges," LeDoux said. McGowan had to be rescued from the drawbridge after she was left hanging when it went up as she was crossing in the 200 block of 200 Southwest 2nd Street back on Oct. 12. 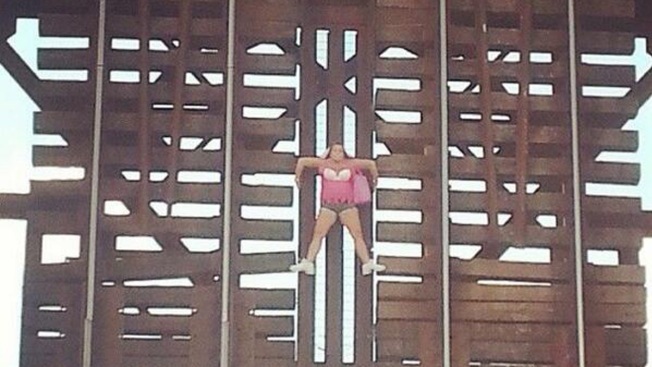 Witnesses said McGowan, believed to be a participant in an area breast cancer awareness event, stayed calm as she held on about 22 feet above the train tracks. There are "No Trespassing" signs posted on both sides and the bridge is in the up position 95 percent of the time, LeDoux said. He said McGowan must have walked on the bridge, which is operated remotely from Jacksonville, as it went up automatically right after a train had passed. Witnesses who saw McGowan hanging onto the bridge between the Riverfront and the historic district Saturday morning posted photos and videos on Twitter and Instagram.